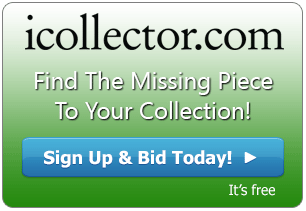 iCollector.com is hosting the next live auction from Helm Auctions on November 28th, 2015. This auction presents a fantastic collection of Anazasi and Casas Grande pottery. Also featured in this auction of 250 lots, are Native American baskets and beadwork, jewelry, kachinas and dolls, paintings, and weavings. Also featured are some pre Columbian artifacts, African and Middle Eastern beadwork, and prehistoric items such as arrowheads, axes, and knives. This diverse sale was carefully prepared with quality consigners and looks to deliver a fantastic day of action at the auction. Lot 1 is an outstanding start to the auction day. Up for auction is an Anasazi Black and White Pitcher which is beautiful. This piece is approximately 1000 years old and is made from clay and paint. It is from the Four Corners Area in the Southwestern part of the US. This was found broken and glued with some minor plaster restoration. One part to note is the unusually styled handle on the pitcher. This picture is estimated to sell at auction for up to $600 and there are several photos available in the online catalog to get a good look at this piece. 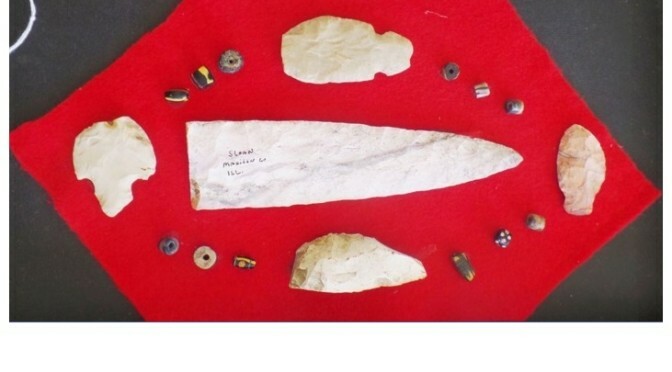 Another featured artifact is an authentic Aztec Flint Blade from around 1400 AD. This is up for auction at Lot 58 and a quality brown translucent flint. It measures 8 ½” x 3” x ½” and is from Central Mexico. There has been some minor restoration of one inch on the small end. A shell and turquoise has been added to the flint, to mimic a photograph from the December 1980 cover of National Geographic. It really is an interesting piece and the presale estimates are $400 to $900. A full array of photos are up for inspection in the online catalog. One of the most valuable pieces in this auction is at Lot 188. The highest bidder will get to add to their collection a beautiful 1950’s silver and turquoise Kachina Bolo Tie. This is an investment quality item and in fine condition. The Kachina portion measures 4.25” long and 2” wide and the overall length of the bolo is 20”. This is Navajo in origin and weighs approximately 77 grams. Bidding is opening at $450 and there will be brisk activity before the hammer drops to the highest bidder. All of the prehistoric pottery and artifacts were taken from private land legally, without breaking any state or federal laws; so bidders can join the auction with confidence. Every item has been photographed and described in the online catalog and bidders can register and place bids any time leading up to the auction. On Saturday, November 28th, the auction will begin live at 1:15 Pacific Time from the Helm Auction location in California. Their excellent service and support are available to answer any questions by email or telephone and they look forward to a fantastic auction.